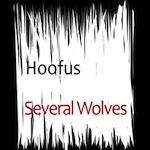 Norfolk based Hoofus produces fuzzy analogue electronics that I can only assume comes from limited access to anything remotely entertaining due to the nature of his geographical location (sorry Norfolk). ‘Data Shunt 89’ and ‘The Loke’ start off the proceedings with a simplistic blast of steady beats and distorted playful synth. However, once the next few tracks start to bed in, the tone for the rest of the album is set. With a nonsensical amount of scattered bleeps and whirs, barely resembling songs due to the fact that all but of them bar five last under two minutes in length, it quickly becomes apparent that, whilst experimental in nature, there is little to listen to and enjoy without wanting to kick your speakers through. Really? People listen to cassettes still? Thankfully this had been burnt up for review and at least it’s downloadable (although the collector in me still doesn’t count digital downloads as proper releases). What we have here are two long tracks of drone and ambient with a touch of the psychedelic and a stab at some field recordings. Providing a stable base to this release are the old radio hums and whirs that give the listener a desolate landscape of sound that are as cold and as bleak as anything I have heard from the genre and ever so reminiscent of work by The Caretaker (sort of). Unfortunately this is the only credit I can give to the artist; it takes a lot of work to produce a fine Dark Ambient album and more talent than many seem to recognise. The opening track ‘And Nor Was He Mistaken’ at least has some grounding, but its counterpart ‘Ondras Rising’ was just a wash of pointless noises and hums, lacking substance, range and the production values necessary when composing such work. Jacob Burns composed this album based on two life experiences. First, was an aural encounter that transpired from leaving a 36-hour train journey and as he exited the station he was swamped with the sound of birds. 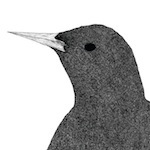 You got it; these were Starlings. The second life-changing event was when Burns moved to London and was taken aback from the intervention of the East London railway extension. I could go on, but really, do you want me to? I am being a trifle harsh. I have spent most of the day writing reviews, most of which suffer from a lack of any form of ‘music’ whatsoever and admittedly, ‘Starlings’ starts out well with a gripping ambience that did manage to keep me enthralled for the first five minutes or so. The remainder of the album is awash with varying scopes of disjointed reality that in some way makes sense when taking on board the subject matter Burns has attached to it. There is an unrelenting, but welcome psychosis that filters through the rafters of this release, but unfortunately, this is lost in translation the further you journey onward.